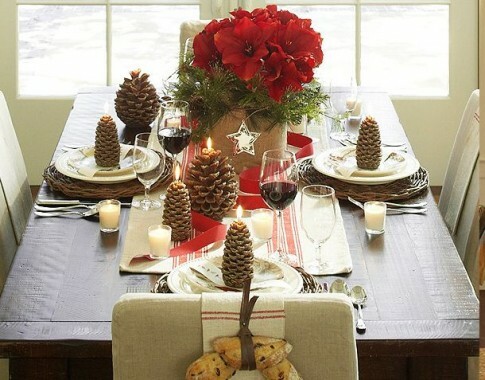 With a young family and a 1929 Tudor home, I want my holiday table to be warm and inviting and not too formal. This picture will serve as my inspiration. I know I have some burlap scraps from a past event that I can use to cover the container for the centerpiece. Red Amaryllis has always been a personal favorite. And, although they may not end up as perfect as the ones pictured here, I plan on sending my kids outside to forage for some pinecones. It’s fun to get them involved. I love crafts, especially during the holiday season! While scouring the internet for some new ideas I came across these free party printables that promise “vintage holiday glam.” To add a whimsical and personal touch to your holiday table, just press print. Napkin “origami” can seem overwhelming at first, but David Stark puts the power in your hands with his easy to follow instructions and unique folds. 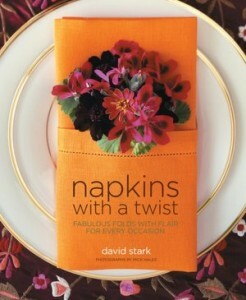 Pick up Stark’s book, Napkins with a Twist, and you will be sure to dazzle your guests as the evening unfolds. The most important part of Chanukah is the menorah, so why not have it as a centerpiece on your table? There are many ways to create your own, but this one I found from Martha Stewart is my favorite and best of all: it’s easy! Candles set in glass bottles—bought or found for a vintage look—will make your table sparkle, while capturing the spirit of the season and its miracles large and small. 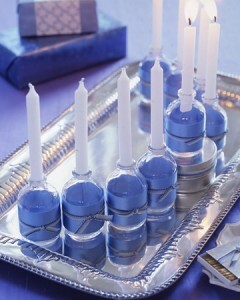 For instructions on how to create this menorah and more, visit Martha Stewart and pick your favorite. If you haven’t found your holiday spirit yet this year, I recommend checking at the bottom of a champagne bottle. Mine was hidden there recently, and once found, my tree and all its trimmings followed tout de suite. 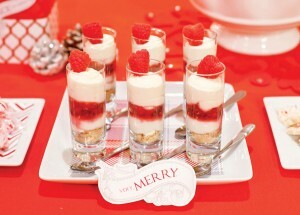 So, for you grinches out there: here’s not one but two recipes for success. The first, from Epicurious—don’t be dissuaded by its name—is dubbed Painful Punch. 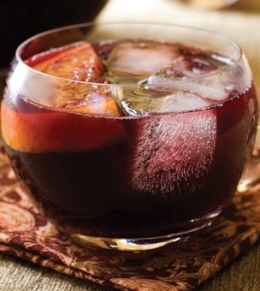 It has everything I love about Sangria with a seasonal infusion of nutmeg, allspice, and cinnamon. The second is from mixologist Lonn Coupel-Howard of Red Rooster. The Mistletoe consists of Champagne, a splash of cinnamon-infused bourbon (drop some cinnamon sticks into an air sealed jar of bourbon for a couple weeks), and a sugar cube dropped into the bottom of the flute. Feeling more joyful already!